What had initially started out as a joke turned out to be an awesome dinner date. To celebrate our three-year anniversary, Martin and I took a few days off work and drove up to the Central Coast. Searching our Yelp! app for a place to eat near our hotel in Atascadero, we noticed a distinctly odd and kitschy name – Crazy Sushi Fever. You’ve got to be kidding me. But the reviews were great, the photos looked appetizing, and it was a mere half mile away. We looked at each other and decided, let’s go for it! After an abysmally long walk (GPS, you lied to me), we arrived at this humble sushi joint exhausted. Fortunately, our spirits were immediately lifted by the welcoming smiles of the chefs behind the counter. We grabbed seats right in front of the main counter and ordered a pair of Asahi Kuronama to quench our thirst. 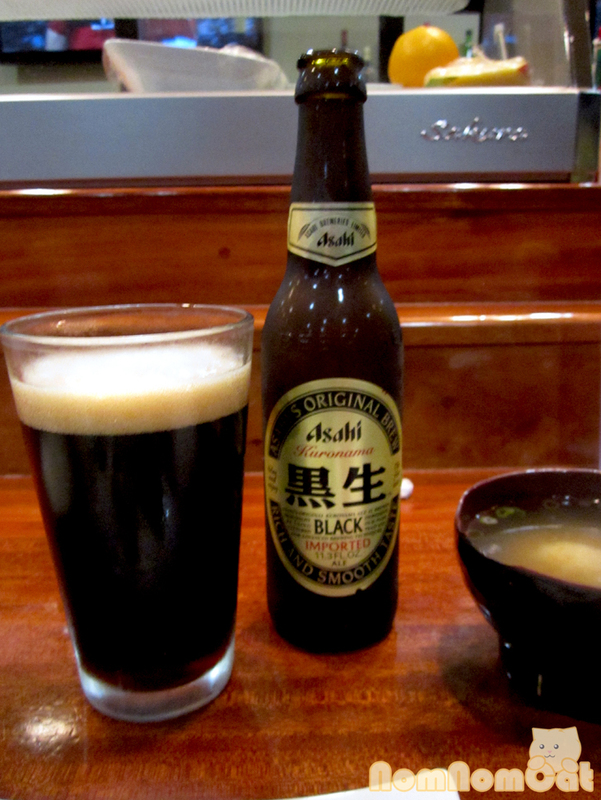 We typically enjoy Asahi Kuronama with yakitori, but it paired surprising well with our sushi as well. 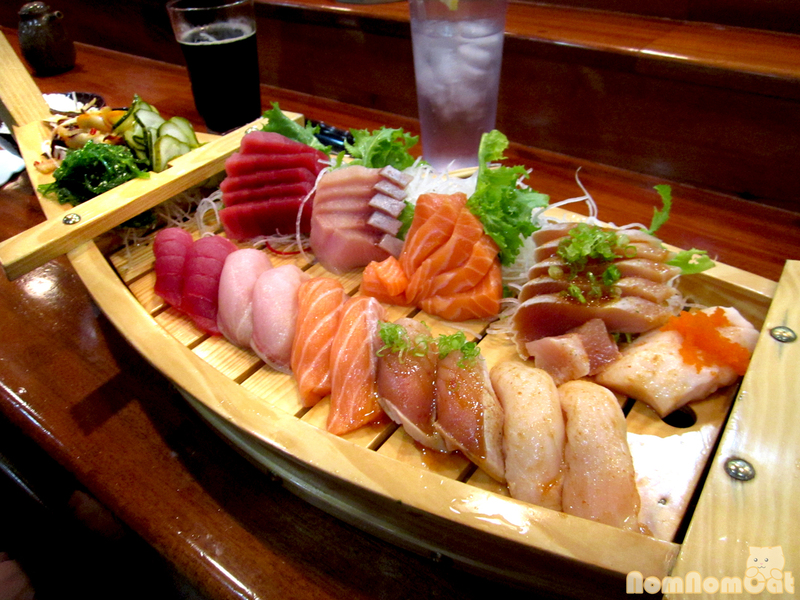 Noticing the prices of the a la carte nigiri sushi ($4+ per pair), we decided to share a boat – the Pismo Boat, an omakase creation of 10 pieces of nigiri sushi and 20 pieces of sashimi. All for $60. Meanwhile, we admired the gleaming slabs of salmon and maguro sitting in the refrigerated case. I couldn’t wait. Okay, so it turned out that the chefs behind the counter were actually Korean. 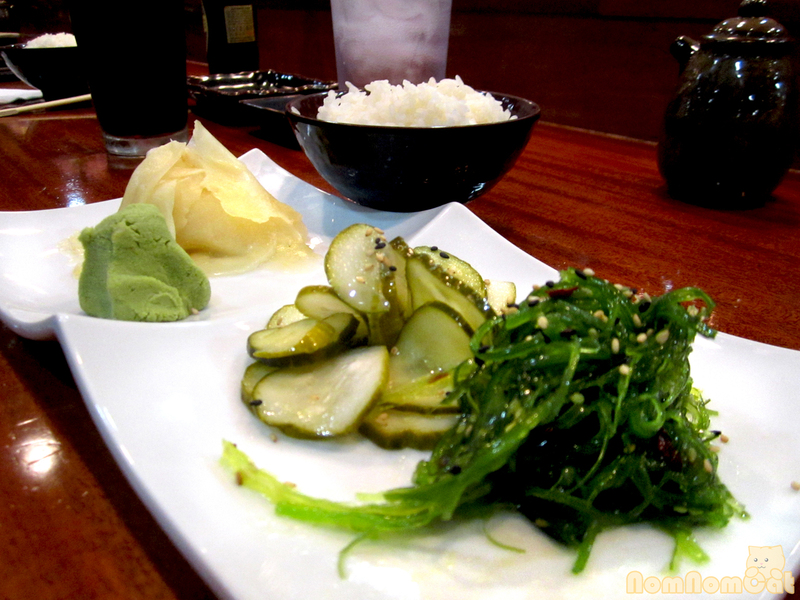 On the bright side, that meant that our customary dish of wasabi and gari (pickled ginger) was served alongside generous mountains of cucumber sunomono and wakame (seaweed salad)… suspiciously reminiscent of the variety of banchan at the start of any Korean meal. No complaints from me! At last, the glorious boat was proudly presented to us. 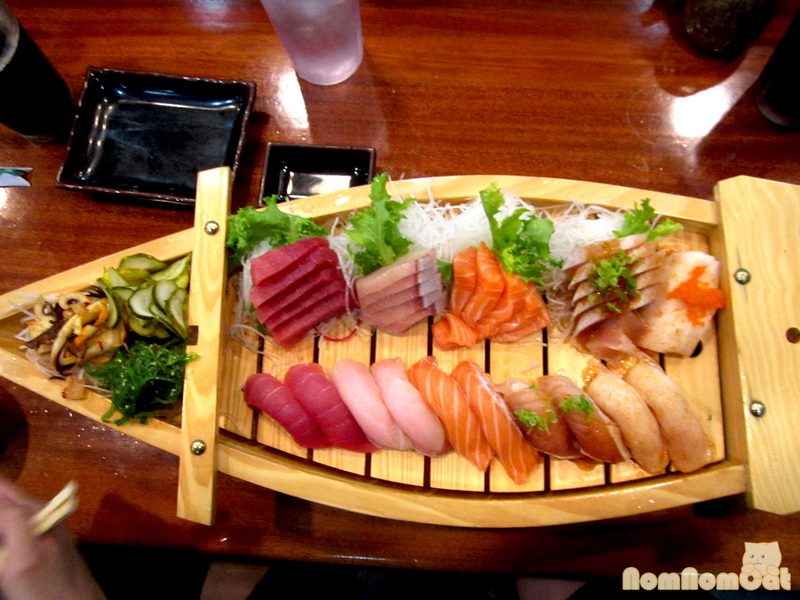 From left to right: maguro (tuna), hamachi (yellowtail), sake (salmon), shiro maguro (albacore), and ono (escolar). All of which looked stunning and tasted wonderful. We dug in, nigiri first. After just one or two pieces, the chef who made our boat caught my attention by waving a mysterious white packet. “Would you like to try some fresh wasabi?” he offered. Of course I said yes! 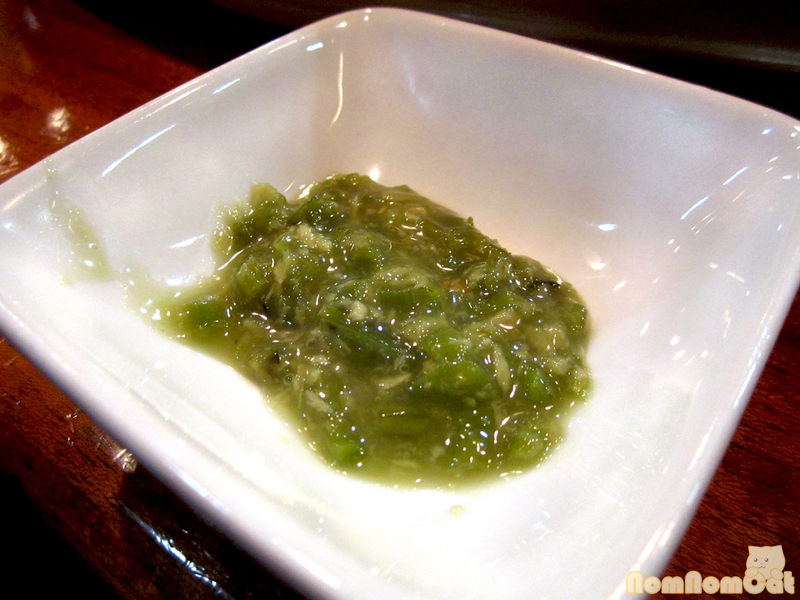 I think I remembered to say please… In any case, he hooked us up with a dollop of chopped wasabi root marinated in a bit of salt. OMG SO GOOD. It’s infinitely better than the pale green paste from the tube or can, and though some may say it’s not the same as fresh grated wasabi root, I think the salt really makes a difference in this prepared version. It pulled out some of the liquid and made this saucy, spicy glaze that tasted amazing on the fresh fish. I’m now on a mission to track down this elusive pouch of kizami wasabi. Tempura green tea ice cream is my guilty pleasure. A perfect sphere of matcha ice cream dipped in tempura batter and rolled in panko bread crumbs, then deep fried to a golden hue. The artsy swirls of chocolate syrup really brought the dessert together and we enjoyed each decadent bite. 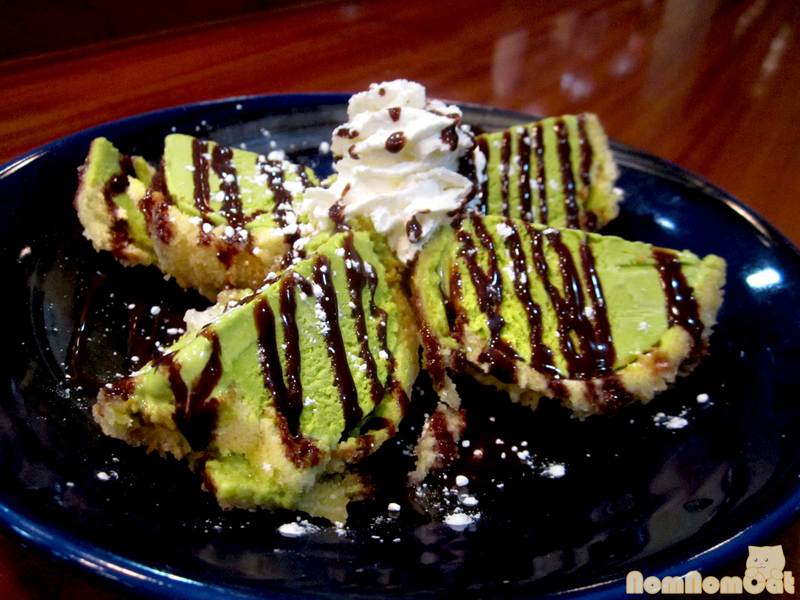 They also have a tempura cheesecake on their menu… talk about avoiding temptation! 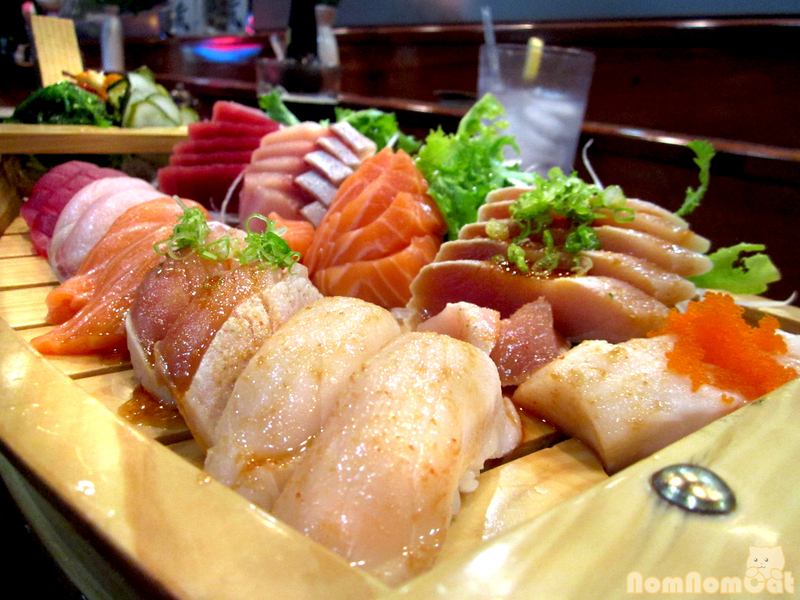 If you ever find yourself in the Central Coast / Paso Robles area with a craving for sushi, we suggest stopping by Crazy Sushi Fever. Peculiar name aside, they are a great place with prompt, friendly service and delicious sushi. And if you ask nicely, maybe they’ll share a bit of their fresh wasabi stash. I have crazy sushi fever. I do!! !